The two day championships saw three national marks falling, with records coming in the High Jump and Javelin Throw. Gumbs-who also took the Javelin Throw with a 42.02m effort-upped his own record mark from 15.58m earlier in the season to 16.33m on his first throw of the evening session in the U18 Boys event. 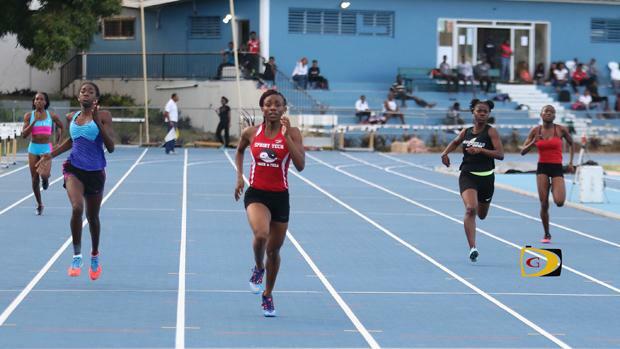 Soon to be 15-year old Beyonce DeFreitas, won the U18 Girls 200m with a personal best run of 24.42 seconds, lowering her previous best of 24.50 from last year when she was fifth in the Carifta Games. Her time broke Nelda Huggins' 2012 U16 record. She ran 25.00 in the prelims. Judine Lacey became the ninth BVI female athlete running the 400m under 56.00 seconds, when she took the final in 55.92, improving on her 56.04 in Friday's prelims. Anguilla's Artesha Richardson established a national record of 56.74 seconds in placing second. Ronique Todman bounced back from a narrow loss to St. Croix's Rodney Griffiths in the 400m-48.63-48.85 seconds to turn back Griffiths in the 200m with a personal best effort of 21.88 seconds to his opponent's 22.42. Josh Hill shaved his U18 Boys 800m personal best from 2:02.98 to 2:02.52.